* HUMP DAY SALE * - Weds 11/7/18 - Use code "HUMPDAY20" for 20% OFF! Thread: * HUMP DAY SALE * - Weds 11/7/18 - Use code "HUMPDAY20" for 20% OFF! Happy Humpday! Use code: HUMPDAY20 for 20% off, today only Weds 11/7/18! Thanks everyone, but that's all the posts for today! Humpday Sale is still going strong for only a couple of more hours so don't miss this opportunity to save 20% on our website. Be sure to use coupon code HUMPDAY20 upon checkout! Have a great night! 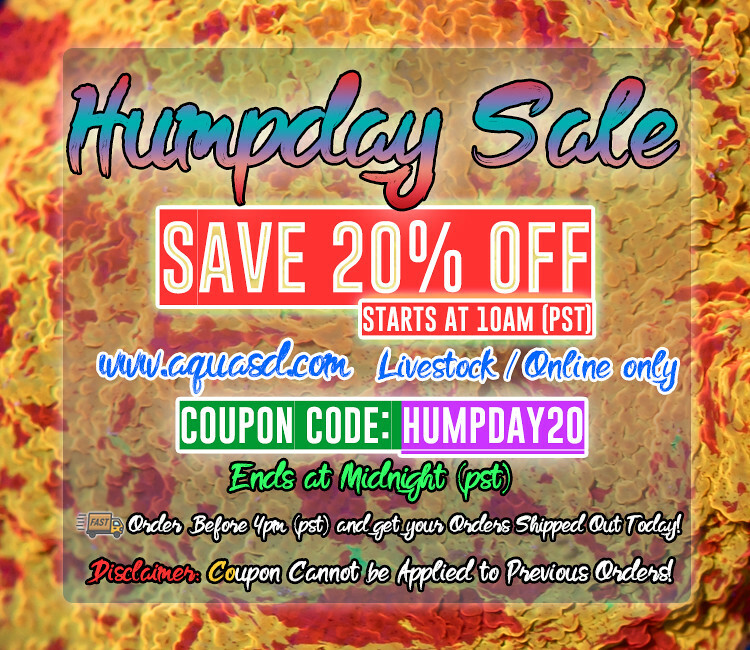 * HUMP DAY SALE * - Weds 10/24 - Use code "HUMPDAY20" for 20% OFF! 20% OFF Today Only 6/6/18 Weds - Hump Day Sale! Reef Central forums - "For Sale" and "the Lounge"?